1) Tackle the new hole the blasted woodpecker has made in the post by the front door before the porch falls down. 2) Clean out the gutters. Again. Yes, someone is going back up on the roof. And yes, that would be the same someone who forgot our anniversary. As both this and chore #1 require someone else to hold the ladder, I can foresee all sorts of calamities before we are done. 3) Clean out the dead moles from the pool filters so the guys can come and close it up without being totally grossed out. 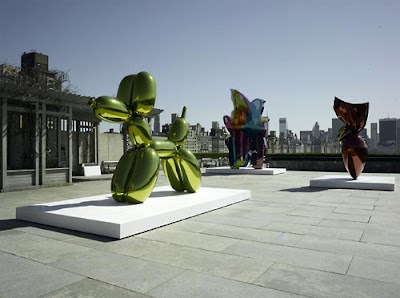 4)Run into the city to see the Jeff Koons exhibit on the roof of the Met before it closes. All these things require fine weather, so it BETTER NOT RAIN BEFORE SUNDAY EVENING. If it rains, who wipes the water spots off the Koonses?